DNR fisheries biologists have started sampling for largemouth bass at Big and Crane lakes in southwestern Noble County to establish quotas on how many bass anglers can remove from each lake this summer. Beginning June 3 on these lakes, the only bass that fishermen will be allowed to keep will be those that are 10 to 14 inches long. This will change the current rule that requires anglers to release all bass that are less than 14 inches long. Once the new rule goes into effect, anglers will be required to release all bass less than 10 inches long and all 14-inch and larger bass. The daily catch limit for bass will remain at five. "We expect a lot of bass to come out of Big and Crane lakes this summer," said DNR fisheries biologist Pearson. "It should be a great opportunity to catch bass for the frying pan and to get others interested in fishing. In fact that is one reason why we selected the June 3 starting date. Free Fishing Weekend is June 4-5." During Free Fishing Weekend, resident anglers are not required to purchase a fishing license in order to fish. 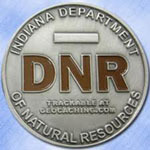 During other days of the year, anglers who are 18 years old or older need a fishing license. DNR biologists say allowing anglers to keep only 10- to 14-inch bass at Big and Crane lakes this summer should help reduce overabundant populations of small, slow-growing bass and eventually increase the number of large bass. "By sampling with shocker boats, we're getting a good estimate of the actual number of 10- to 14-inch bass in each lake and we'll be able to determine how many bass we want anglers to take out," Pearson said. "After the quotas are reached, the standard 14-inch minimum size limit will go back into effect." Creel clerks will be stationed at both lakes throughout the summer to count the number of bass taken. Based on preliminary results of sampling, both lakes contain about three times the normal number of bass, most of which are 10-to-14 inches long. Anglers will likely be allowed, therefore, to remove up to two-thirds of them. Actual quotas will be set once sampling is complete in late May.